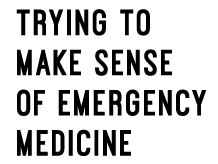 Recently I was lucky enough to have attended the ‘EMECG’ course in Cape Town, SA. It was a 2-day event that took place at the beautiful V&A waterfront. champing at the bit to demonstrate my improved interpretation skills at work! 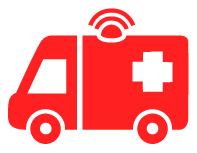 Check out the EMECG website here, and their Facebook page here. 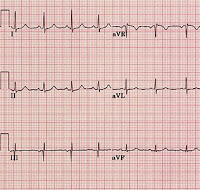 A particularly standout learning experience was being taught how to identify the culprit vessel when considering ST-elevation myocardial infarction. It’s a concept that I’ve always struggled to wrap my head around, and am very pleased to now have it firmly in my arsenal of ECG skills. 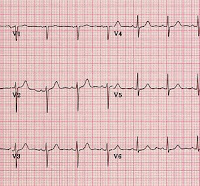 The first step towards understanding how to hunt the culprit vessel (or accurately interpret any ECG for that matter), is to go right back to basics and revise the ECG leads. 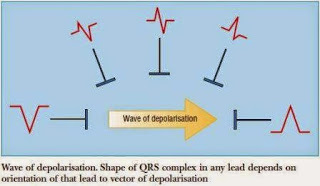 An ECG lead is a graphic representation, or ‘snapshot’, of electrical activity (depolarisation/repolarisation) within the heart. Each lead ‘looks’ at the heart from a different position, and takes an electrical photograph… so to speak! 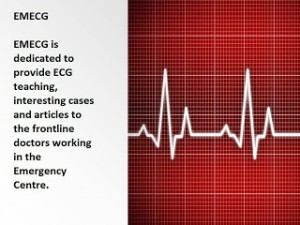 There are 12 leads on a standard ECG. 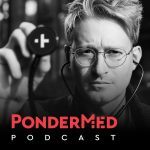 More are possible depending on the clinical question being asked – this will be discussed in later posts where various types of STEMI are considered. The position from which each lead ‘looks’ at the heart (it’s plane) is defined by a positive and negative ‘pole‘. The positive pole is a ‘sensing’ electrode, which can be placed at various anatomical locations on the body, depending on the lead it is measuring voltage for. The negative pole is a reference point for the positive pole. 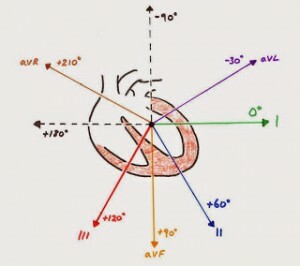 If the vector moves towards the positive pole, there will be a positive deflection on the ECG. If the vector moves away from the positive pole, there will be a negative deflection. 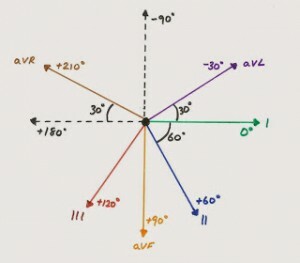 If the vector is perpendicular to the positive pole, there will be little/no deflection. Key point – a lead is NOT the same as an electrode! A lead is an electrical picture of the heart… An electrode measures voltage – this allows the production of a lead by a machine. The 6 limb leads examine of the heart in a vertical/coronal plane. Electrodes are placed on the right arm, left arm, right leg and left leg. The limb leads are divided into the standard limb leads and augmented limb leads. The standard limb leads (I, II, III) form ‘Eindhoven’s triangle’ – the original 3-lead ECG from 1903! They are ‘bipolar’ leads as both poles are electrodes on the body. Lead I – right arm electrode negative pole, left arm electrode positive pole. Lead II – right arm electrode negative pole, left leg electrode positive pole. Lead III – left arm electrode negative pole, left leg electrode positive pole. NB: the right leg electrode is the ‘grounding electrode‘ – it is not involved in any leads, but the ECG will not record unless the electrode is attached. Lead II takes a snapshot 60 degrees further clockwise from lead I. Lead III takes a snapshot a further 60 degrees from lead II. I + III = II (This is ‘Eindhoven’s Law‘ – i.e. the combined measured voltages of leads I and III equal that of lead II). The standard limb leads that form Eindhoven’s triangle can be used to create a new reference point – Wilson’s central terminal. Wilson’s central terminal is a virtual pole that is composed of the average of the electrical potentials from the 3 standard limb leads. It is found in the centre of Eindhoven’s triangle. Strictly, Wilson’s central terminal should be called the ‘zero’ pole, but conceptually it is easier to think about it as the ‘negative pole’ for the augmented limb leads. The augmented limb leads are ‘unipolar‘ leads (as there isn’t really a negative pole). When you combine the standard limb leads and the augmented limb leads you get the following pattern of ‘views’ – the ‘Hexaxial System’. 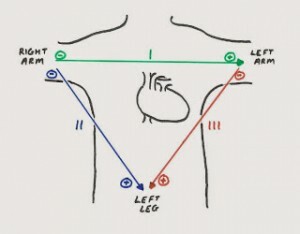 Remember that the limb leads look at the heart in a vertical/coronal plane. 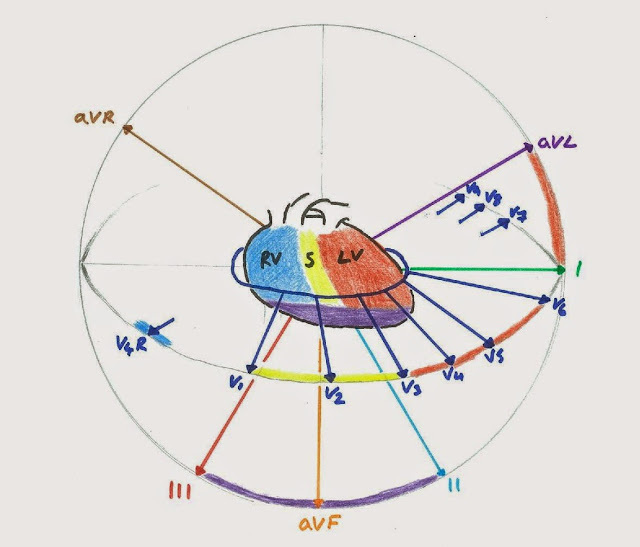 Leads II, III and aVF look at the inferior heart. They are, therefore, the inferior leads. Leads I and aVL look at the lateral left ventricle. They, therefore, form 2 of the lateral leads (the other lateral leads are the lateral precordial leads). 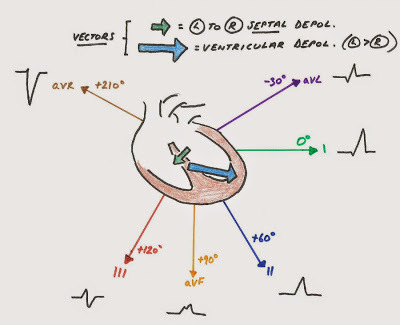 During ventricular contraction there is a wave of depolarisation that creates a huge number of individual vectors. 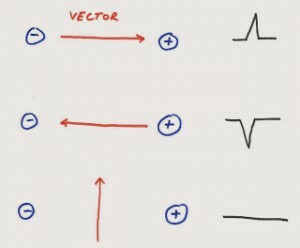 The ‘mean vector‘ (or ‘depolarisation vector‘) is the average of all those vectors, and it is this which manifests as the electrical photograph we see on the ECG (the QRS complex). The initial event is a left-to-right depolarisation of the septum – a down/rightward mean vector results. This is quickly followed by ventricular contraction – this results in a down/leftward mean vector. It is more leftward as the LV has a greater muscle mass than the RV. Now the morphology of the QRS complexes in the limb leads make more sense (see diagram below!). 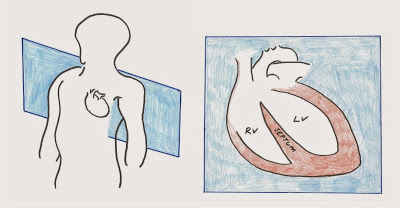 The 6 precordial leads (V1-V6) examine the flow of electrical activity through the heart in the transverse/horizontal plane. The reference point for each of these positive poles is Wilson’s central terminal. 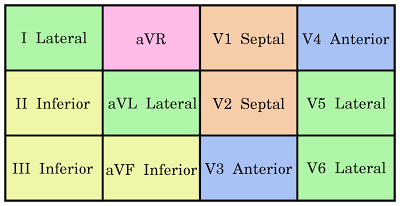 Therefore, the precordial leads are also ‘unipolar‘ leads (along with the aV leads). 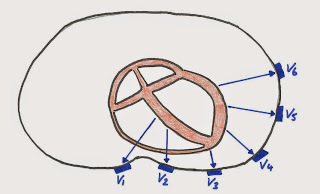 V1 and V2 face the surface of the right ventricle, as is demonstrated in the diagram. However, they also face the septum, which has a greater muscle mass, and therefore the leads are more strongly influenced by electrical activity in this structure. They are, therefore, known as the septal leads. 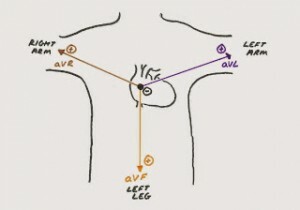 V3 and V4 takes a snapshot of the anterior wall of the LV. V5 and V6 take a snapshot of the lateral wall of the LV. 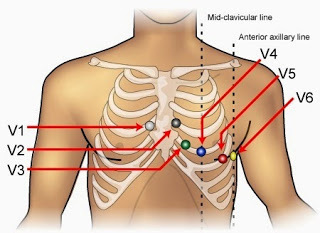 Each ECG lead is an electrical ‘snapshot’ of the heart taken from a specific position. Waves of depolarisation create vectors which are sensed by a positive pole (an electrode on the body). A negative pole (standard limb leads), or Wilson’s central terminal (aV + precordial leads), is the reference point for each positive pole. 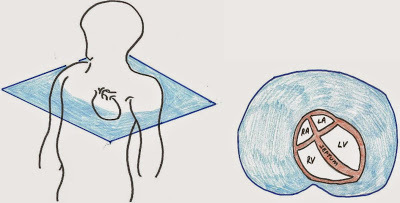 The limb leads view electrical activity in the heart in the vertical/coronal plane. 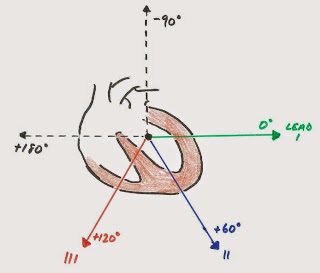 The precordial leads view electrical activity in the heart in the transverse/horizontal plane. Understanding the anatomical area of the heart that each lead ‘looks’ at, allows mapping of pathology on the ECG. I’m a 3rd year medical student at the University of Glasgow, I think this is an amazing description of the ECG – can’t wait for the next instalments!! Hands down the best explanation I’ve ever stumbled upon; I’ve never understood this properly before but it has finally clicked! Thank you so much, and please keep writing!